tad 1601 speaker w box..
Tad 1601 with original box. best sounding speaker (in my opinion) hands down. PRICE IS FOR ONE SPEAKER EACH. W / ORIGINAL BOX. In perfect working condition with original beryllium diaphragms. TAD TD-4002 High Frequency Driver pair with throats. All products are tested by experienced engineers utilizing the latest in computerized evaluation techniques. This is the only center channel applicable for Pioneer S-1ex, S-2ex and TAD reference speakers. Prefer local pick up. This speaker by itself is at least 65 lbs. Maximun power 130W, Puissance maximale 130W, Impedance 6ohm. 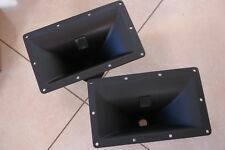 Both speaker serial no. MADE IN JAPAN. Serial No: QE10934 & QE10935. 100%Clone form the original TAD TH-2002 horn. MADE IN JAPAN. The speaker is oversized and and inside the box, so pictures are limited, but I could take more if requested. Local Pickup is preferred. 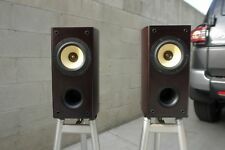 3-way bass reflex floor loudspeaker. Nominal impedance: 4 Ω (minimum 4.1 Ω). Serial no. QI 0255 and QI 0256, MADE IN JAPAN. For Sale is 1 JBL 435Be BERYLLIUM COMPRESSION DRIVER. This is in great working condition, and has been fully tested and work great sound very nice. Serial no. QF 10601 and QF 10602, MADE IN JAPAN. 1.75" JBL ALUMINUM DIAPHRAGM. 1" THROAT WITH STANDARD JBL/TAD 3-BOLT HORN. ONE PAIR FIELD COIL POWERED COMPRESSION DIVER. TAD 1601 speakers with Sub and Horn. Owned and Operated by the late grammy winning recording engineer Dennis Dragon. REPLACES ANY JBL, TAD, OTHER 2" THROAT DRIVER. 300-18K FREQUENCY RESPONSE ON CORRECT HORN. PT-R6 Super Ribbon Tweeter. Our product is 100% authentic! Our price is 100% negotiable! Weight : 1.5Kg. ■Output : 94dB/w/m. USES JBL 2435 BERYLLIUM DIAPHRAGM ON AN ALTEC 288 TOP PLATE AND PHASE PLUG. WILL NOT FATIGUE AND CRACK AS ALUMINUM. 2" THROAT WITH STANDARD JBL/TAD 4-BOLT HORN. FORGED BERYLLIUM DIAPHRAGM HAS MORE DETAIL AND. 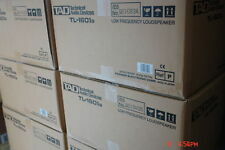 TAD TH-4001 clones for sale. Pioneer S-2EX TAD EXCELLENCE Series Speaker CP-2EX in the original factory-specific tripod. PIONEER PH-50 Sectoral Horn PD-50 Driver Unit. Form Sectoral horn. Type Driver Unit. Our product is 100% authentic! Unit fixing screw 34phimm pitch 1.5mm. The angle which spreads horizontally : 90 degrees. PT-R4 Ribbon Super Tweeter. Type Ribbon Tweeter. Our product is 100% authentic! Hi Pass Filter. Frequency Response 9,000 Hz ～ 120,000 Hz(HPF 20kHz). Input Impedance 6 Ω. Very rare sophisticated desing Pioneer beryllium midrange drivers DS-042A for sale from Pioneer S-955 speaker system. The price is cheap for a beryllium mid drivers. Similar TAD drivers cost from 3K and more by now. Handmade wooden horn project WE 22A. I can make another adapter. Pair of horns adapters for WE555. Price for 2 pcs. -75cm height-76.5cm.